There is no doubt that travel photography is one of the most popular types of photography. Outside of special occasions, most only use their cameras when they take a trip away. In fact how many can honestly raise their hands and admit their camera sits collecting dust between trips? It is obvious why this is the case. We wouldn’t think twice about photographing our own surroundings, we take it for granted and because we see our local area so often, it doesn’t inspire us. This is even true for people who live in parts of the world that are very photogenic. Once we go outside familiar surroundings everything looks fresh and the impact of seeing something different inspires us to photograph it. When we travel, we like to document our travels through photographs, mainly to show others on our return. Also when travelling, people are usually accompanied by family and friends and it gives us a chance to photograph them, which we rarely seem to have time to do at home. Travel photographs aren’t just about photographing places and the people you are with, but also the people who live there and the events that may take place in your destination. In fact travel photos can be broken down into three categories; People, places and events. Images of people are an important part of documenting a visit. To many people, travel is about visiting strange and exotic locations. Don’t forget though that it’s the people who live in these locations that often add the “strange and exotic” to the location. Sometimes it’s not always the locals who add this element to a location, the visitors can often add to the atmosphere of the location..In the image left there is a couple dining in a sidewalk cafe in Rome. 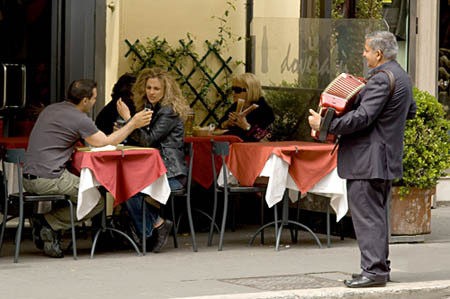 The local accordianist adds that sense of romance to the image. There may be a number of reasons why we travel to a particular location. It could be to enjoy some fine weather, to visit well known attractions such as theme parks, to explore its history and historical landmarks, to enjoy its natural beauty or to visit friends and family. Whatever the reason there will probably be well known landmarks or just scenes that immediately identify the location. Some would be very well known and others less so. One well known natural landmark is the Geysers in Yellowstone National Park. 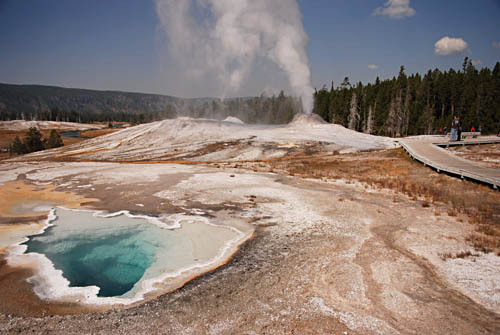 There are a total of 900 geysers throughout the world, 150 of these are found in Yellowstone in Wyoming, USA. Because these are so rare, they can make amazing photographic subjects as seen in the image on the right. One geyser found in Yellowstone is called Old Faithful which gains its name because its eruptions can be predicted to within +/- 10 minutes. An event is often the reason for a visit to a specific place. These could be festivals, fairs, religious occasions or rituals. This may be your main reason for visiting. When planning a trip to any sort of destination, find out when these events are on and try to plan your trip during that time, even if its not your sole reason for visiting the locality. Most popular destinations are done up to look their best for special events or occasions. What better event is a parade? St. Patrick’s Day parades take place all over the world, the more famous parades actually take place in the United States. 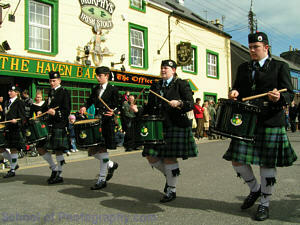 But there is nothing to match the real thing; a St. Patrick’s Day Parade in Ireland, home of St. Patrick (Fig 4). To learn more about how to get professional travel images, join our Travel Photography Course.